On Tuesday city transportation planners presented more than 100 members of the public with early results of a months-long study of the Broadway/Lincoln corridor. They offered some options to help achieve Mayor Michael Hancock’s goals for a more mobile city, and asked for input from residents and business owners. According to the study Denver’s most important north-south streets cater to cars that drive too fast, and can be changed to become safer places for people walking, biking, using transit, and driving. That’s why a two-way protected bike lane on Broadway has been at the center of the discussion for more than a year. Meanwhile, in September, an average of 135 people on bikes daily used Broadway and Lincoln during peak hours. But they didn’t have a safe place to ride, so they used the sidewalk, the bus lane, or the travel lane — where people usually drive well above the 30 mph speed limit. A bike lane would offer a safe way to move people along the city’s spine and give everyone more options for getting around. Reclaiming one of Broadway’s five massive travel lanes for people on bikes is one option the city presented. Residents and city planners first identified that option in the 2014 Golden Triangle Neighborhood plan [PDF]. Another option would reclaim a lane from both Lincoln and Broadway and convert them to one-way protected bike lanes. But what about the inevitable complaints from people who believe driving faster than the legal limit is a human right? 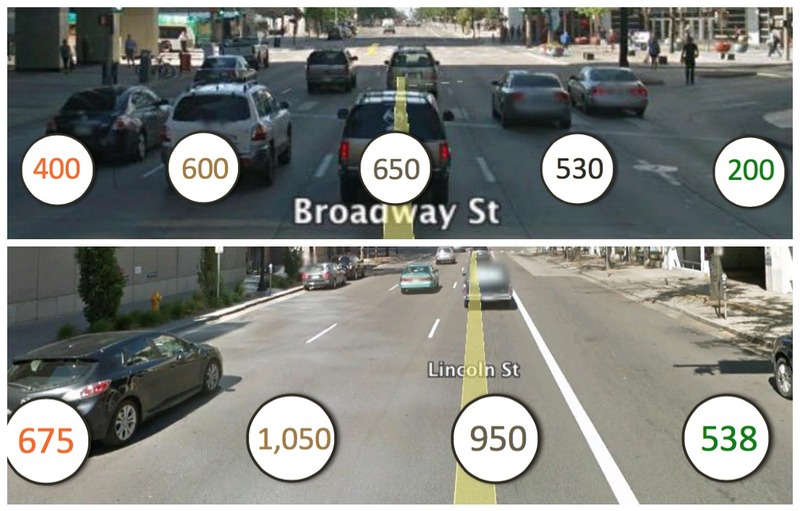 Planners studied how many cars each lane could handle per hour during both streets’ heaviest periods — morning rush hour for Lincoln and afternoon rush hour for Broadway. They found that Lincoln’s four lanes moved about 1,000 more cars than Broadway’s five, indicating that Broadway could operate at its current capacity if planners reclaimed a car lane for bike travel. “I think the big issue is you don’t want to mess with people’s commute, and I’m one of those people,” said Sarah Thomas, a Capitol Hill resident who drives and bikes, and works in Englewood. “But traffic isn’t getting better, traffic is only getting worse, and I want to get out of my car as quick as possible, and I want there to be an easy alternative.” Thomas added that better transit should be part of the solution. 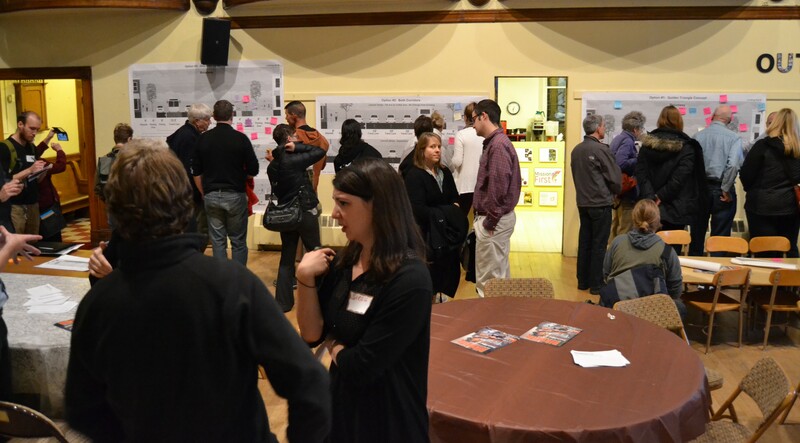 Tuesday’s public meeting came after planners went door-to-door and spoke with more than 200 business owners and residents. The workshop was the first of several leading up to a six-week demo that will include a temporary protected bike lane on the corridor. The entire presentation will be available on the project’s website by the end of the week. This is absurd economics. The one-way thoroughfares in Denver offer the most efficient chance at moving peak-time traffic in and out of Denver. The side streets to these thoroughfares are practically empty. Instead of bicycles using the most-expensive cost-per-passenger lanes of the thoroughfares, they should be on the side streets. Where they are considerably less exposed to injury. You must not ride much, Being on a fairway with clear bike lanes is much safer than riding on a small street with no lanes and parked cars on both sides, not to mention having to cross lights constantly, while on broadway the light structure is timed well for both bikes and cars! If you look at the plan, the addition of the turn lane will likely help throughput as has been seen in New York’s and Torontos examples! Broadway is a comparitive wasteland. In reality, the road should be shrunk to one car lane each direction with one bus lane each direction . The rest for a real dedicated bike lane and better sidewalks. Broadway is not a freeway.